One Salvy Point for every dollar spent on all items in our website. Redeem points for a cash value which is applied as a credit on any order. Start redeeming points at the $5.00 level or 62 Salvy Points. Receive points for your birthday. Receive points as you enter each tier in the program. Redeem points to give cash to your favorite charities. Get special discount promotional codes exclusive to Salvy's Rewards members. Get double points specials throughout the year. Receive 100 Salvy Points worth $8.00 for every friend your refer who makes a purchase. Become a Salvy's Rewards member and get 75 Salvy Points for joining and then get another 125 Salvy Points for entering the Rose Tier. That means you get $16.00 of immediate cash to use on orders simply for joining our free program! We believe in community service. You can use your Salvy's Rewards Points to make a Charitable Contribution through Charity Choice. Tell us how many points you want to use for a charity. 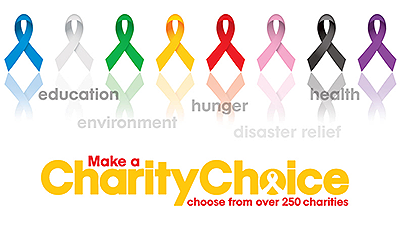 We'll email you a gift card for the amount to redeem at Charity Choice's over 250 charities. You also receive a badge, Facebook Post on our website featuring your charitable donation, and a listing in our monthly newsletter. customerservice@salvytheflorist.com or use our "Customer Service Form" and tell us what you want in the comments section.